Medical technology company ResMed won Standards Australia‘s prestigious Australian Design Award of the Year for 2006 for its portable S8 AutoSet Spirit flow generator and HumidAire 3i Humidifier system. These gadgets are used to treat sleep apnea. This is encouraging to me as I bought one of these machines less than a week before the award! The Australian Design Awards is Australia’s only national product design awards program. More than 250 products across 11 categories were entered this year. An international panel of designers from America, Sweden, Korea, the Netherlands and Australia shortlisted the entries to 104. The entries were then assessed by a panel of industry professionals, who spent a full week judging the originality, design, safety and commercial viability of the products. The Australian Design Awards is recognised by the Australian Government and the International Council of Societies of Industrial Design as the peak promotional award for the Australian design. If not treated during sleep, sleep apnea can narrow or close a person’s upper airway to cause snoring or, in some cases, stop airflow for as long as 10 seconds. This sleep disturbance may occur several hundred times a night resulting in tiredness and may contribute to other serious health conditions such as high blood pressure, heart disease, stroke, diabetes and depression. 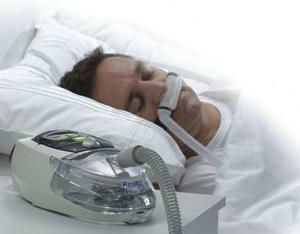 A treatment machine uses a flow lightly pressurized air to keep the upper airway open – CPAP (‘Continuous Positive Airway Pressure’). I’ve used a conventional machine for some years with reasonable success, but the automatic machine gives me better sleep. It’s not cheap, however. You shouldn’t buy and use one without medical advice, but if you do know just what you need, you can save a bundle by shopping around and buying online from a reputable company. Unlike conventional CPAP devices, the AutoSpirit delivers air at a pressure level that varies automatically as the patients needs change during sleep. ResMed also won the 2006 Western Sydney Industry Award for Excellence and Innovation in the Most Outstanding Large Business category. It’s great to see an Aussie company producing such a superb high-tech product, exported world-wide.